We invite you to explore one of our Personal Care Suites through our interactive virtual tours. Please contact Erin Trout today to schedule a tour of our Healthcare Program or a free nursing assessment. 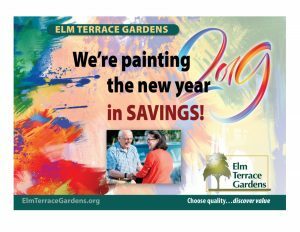 Get More InformationHave information sent to youFree Lunch & TourGet a taste of life at Elm Terrace!Tell a FriendShare this with a loved one or friend.